The ultimate failure of the “prodigal” son! This past Saturday, amidst media frenzy; goatee stuttering spineless Saad took his “courage” into his own hands (or shall I say executed a Saudi command) and ventured onto a trip to the land of bloodily love. This lost child (with a new found selective memory, just like every Lebanese he and M14’s represent) chose to forget about Syrian arrest warrants issued against his closets of allies, by those he publicly claimed had a hand in the killing of his father. So he went alone, not by choice. No it was not an official visit, for there was no official invitation. So what was it then? A similar visit to the one Walid Jumblat did after the killing of his father (and by whom, one might wonder)? Has it become a part of Lebanese culture to pay respect and homage to our slayer? Humor me if you will, for I am a part of the “sheeple” that constitute this “great” nation of ours. I have tried (unlike many others) to find a hint of logic or a half cooked excuse for Saad “lonely” walk along the presidential corridor, and the obvious (long lasting) grin on Bashar’s face, before the (what has become) famous kisses on the “killer’s” cheeks. I still came out empty. My little, abused brain by so many empty slogans, cannot still comprehend nor accept such a blatant “you fucked me, thank you sir may I have another”. Yes many of you (even those who have warrants issued against them) may argue that this visit stems from the fact that our dear stuttering idiot of a prime minister is acting as a representative of the people (my foot, for he forgot why the people voted for him), and has grown beyond personal feelings and vendetta. But a few of you harbor this bitter feeling that he (and his allies) were unworthy of our votes in the past elections; for he has capitulated. French policy of “rapprochement”(with Syria that is), headed by some “arriviste” gigolo who would have been better off pleasuring his sexually edible wife (which I guess he is doing). A first “African American” president with arms extended, having inherited a failed foreign policies from his “new born Christian” predecessor with a “Divine” (failed) mission. A local Mullah armed to the teeth threatening to wage a holly Jihad against fellow Muslims “first” in order to establish his long “pipe” dream of Wilayet al Faqih. An orange demented “Iznogood” to whom he made the most concessions. A major player in the region who still stands defiant; and is still building its nuclear capabilities, and sponsoring local foes. 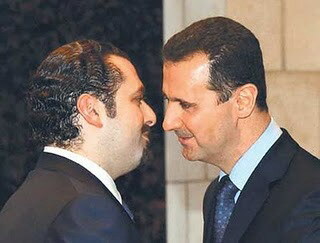 Stuttering Saad went to Syria, embraced Bashar, kissed him on the cheek, and had the reception of kings. For me, that is a problem. That is a true description of why we need “new blood”; but what pisses me off the most is when someone like our dear ex President (monsieur 20%) Amine Gemayel has the audacity to say, and I quote “I was amongst the fist supporters of Hariri’s visit to Syria”, but WAIT FOR IT…………..”the wounds run deep”. What wounds if I may ask, the one they inflicted on your departed son? Wlek ألله يرحم أمواتنا for you have sold them short.